Brian, Brendan and Domhnall Gleeson in 'Psychic'. Brendan Gleeson’s new short film ‘Psychic’, which features the full Gleeson family across the cast and credits, will air on Sky Arts this St Patrick’s Day. IFTN spoke with Brendan to find out more about making his directorial debut and working with a family ensemble. 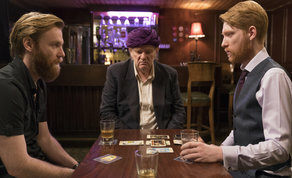 ‘Psychic’ not only marks Brendan Gleeson’s directorial debut, but it is also the first time that the Emmy-winning actor has had the chance to work with all four sons. Fergus Gleeson provided the music for the film. The film, which launched at the Galway Film Fleadh in 2018, also stars Ingrid Craigie (The Delinquent Season, When Harvey Met Bob) and is co-funded by Fís Éireann/Screen Ireland and Sky Arts. Psychic is produced by Juliette Bonass (A Date for Mad Mary, Glassland, The Last Hotel for Sky Arts) and Brendan Gleeson. David Grennan (What Richard Did, Maze) is director of photography with Tamara Conboy (Once, Sensation) as production designer, Consolata Boyle (Victoria and Abdul, The Queen) as Costume Designer and Isobel Stephenson (Garage, Adam and Paul) as Editor. ‘Psychic’ airs at 9pm on Sky Arts and NOW TV this Sunday 17th March.